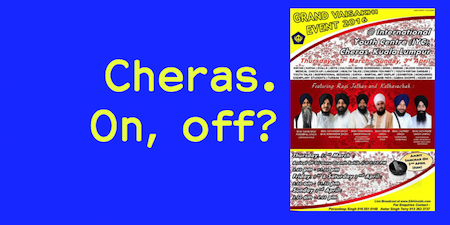 Cheras Vaisakhi programme: on or off? The question on whether Sikh Naujawan Sabha Malaysia (SNSM) should go ahead with the annual Vaisakhi programme at Cheras comes at a critical time for the five-decade old organisation. At the heart of the matter is the financial position of SNSM, popularly known as Naujawan Sabha in Malaysia. Some members are already labelling it a financial crisis. “We were struggling to pay up the outstanding bills for the annual samelan. The Cheras programme will add to the Sabha’s current financial woes,” one SNSM official told the Asia Samachar. This is the setting of an on-going debate within the key SNSM circle of influence. A group of SNSM veteran volunteers, who are actively assisting with the organisation’s camp-site like project at Kuala Kubu Bharu (KKB), are pressing the SNSM executive committee (exco) to drop the idea of holding the annual Vaisakhi kick-off programme at the International Youth Centre (IYC) in Cheras, Kuala Lumpur, on the count of severe shortage of funds. “The Sabha exco is already dipping its hands into funds set aside for the KKB development to settle day-to-day and project bills. They have been spending more than they can raise,” the official said. When the SNSM headquarters in Bangsar was sold in 2006, a certain amount was set aside for the development of the project in KKB, Selangor. SNSM had just completed its flagship programme, the Annual Gurmat Parchaar Samelan, in December 2015. For the first time, the annual camp – which attracts close to 1,000 participants and about 300 volunteer facilitators – was held at the Khalsa Land, the camp site of SNSM in KKB, Selangor. In the past, it used to be held at national schools. Organising it at its own camp site – no doubt a dream for many members for a long time – meant incurring extra costs. It was a major concerns raised at SNSM’s last annual general meeting. See here. In the past few years, SNSM had benefitted from Federal government funding, with the last annual tranche coming in 2013. With no new injection of government funds and a major dip in donations from the public, the SNSM activities and expenditure, however, have seemingly not decreased. This has resulted in its present financial woes, according to volunteers familiar with the organisation’s financial situation. Amarjeet Singh, a former SNSM jathedar and now meet (deputy) jathedar, says that there had seen a ‘sharp drop’ in public donations to the organisation. “With the Government funding having dried up, Sabha has to go back to its original base: the Sanggat at large. Daswand funds have to be sourced. At the same time, activities have to adjust to reflect the present funding position,” he tells Asia Samachar. This financial predicament has led to a group urging the SNSM exco to pull the plugs from the Cheras programme, and consider hosting it an a local gurdwara. At the last SNSM executive committee held in late February, it is understood that some eco members had expressed strong views that SNSM should not proceed with the event in Cheras, but to move it to local gurdwaras instead. The poster for the programme, scheduled for the 31 March to 3 April, has already been released. At the time of writing, the SNSM exco has not publicly provided an update as to whether the Vaisakhi programme will be held at Cheras or taken elsewhere. A decision awaited for years has finally been taken. This proposal is not new it was discussed and Gurdwara Committees agreed to all terms to hold the event within the Gurdwara premises yet it did not materialize. Aside from the economics, the holding of the event within the Gurdwara is fundamentally correct as all material used in Cheras was always from Gurdwaras and yet we had to clean and pay for the premises. The lack of financial support needs to looked at as most of the prominent Sikhs have had their foundation and growth with the Sabha and need to support it despite differing views we cannot let the goose that laid the golden egg die of malnutrition. The next step is the program content, our children and youths need messages that they understand in a language relevant to them and Malaysia and the Sabha has many such preachers use them SIKH Malaysia Boleh foreigners cannot deliver what Malaysians need. My appreciation and thanks on the prompt decision and announcement by Sardar Pavandeep Singh – Jathdar SNSM on holding the annual event at Gurdwara Sahib Klang. The view of the Management Committee of SNSM on the above suggestion would be appreciated. After taking into consideration escalating cost it is therefore decided that this year’s Vesakhi Grand Event will be shifted to Gurdwara Sahib Klang. There will be no changes in the invited Jathas and programme schedule. The whole programme designed for IYC Cheras will be carried out in Gurdwara Sahib Klang. Looking at the current economic situation this will be one good way to prudently spend the sangat’s money wisely. In view of this, it will be more worthwhile to spend on more effective parchar activities rather than one programme. Request to the whole Sanggat and Sewaaars to give full support for the program in Klang. We take this opportunity to thank the committee of Gurdwara Sahib Klang for their support to carry out this event hand in hand with SNSM. Klang is a good choice as KTM Komuter provides regular transport with the Gurdwara being in walming distance. Also SNSM vehicles can be used as shuttles between Klang Bus Terminal and Rail Station. Others with cars can also participate. People can park cars at KTM Stations. This can continue until SNSM is in a position to hold its functions at KKB KHALSA LAND. Members as bulk of funds are donated by Sanggat who are not registefed members. THIS IS TRANSPARENCY AND WILL PREVENT any SUSPICION REGARDING ACCOUNTS.